In this article, we’re going to be talking about the top 10 best Bass Multi Effects Pedals that you can get for your bass rig in 2019. However, before we do this, we’re going to first talk about what exactly a bass effects pedal does, and the main advantages and disadvantages over using singular function pedals such as a bass compressor pedal or bass chorus pedal. What are Bass Multi Effect Pedals? 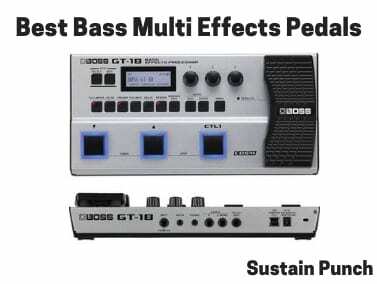 What are the main advantages and disadvantages of using a Multi-Effects Pedal for Bass? In Conclusion, which bass multi-effects pedal would you recommend? Simply put, a Bass Multi-Effects Processor combines a multitude of bass effects within a single physical unit, making it particularly convenient for a bassist as they do not need to purchase an entire pedal board, wiring kits and individual effects pedals. Usually, these units come with the standard effects which include compression/limiter, EQ, distortion, overdrive, delay, reverb, tuner, chorus and a few more. Additionally, they are generally significantly lower in cost than if you were to purchase all of the equivalent singular pedals that would provide the same functionality. As for the disadvantages, we’re a little hesitant to discuss these, as they’re less applicable in this case, as we’re only sharing the 10 best bass multi-effects pedals, and hence these disadvantages don’t necessarily apply to these. The singular effect pedals usually have analogue circuitry, giving it a more natural, warmer sound… Most multi-effects units use digital circuitry, although we have featured a few analog pedals. There are fewer sounds available in a singular effects pedal, thus the development teams can focus on these select few and effect these much easier than if there were 100s. Therefore it’s simply a choice as to, do the benefits outweigh the drawbacks… If so, then read on where we’ll be discussing the 10 top bass multi effects pedals. Otherwise, take a look at our range of singular function effect pedals reviews. As always, the list below featuring all of the best bass multi-effects units is ordered by price, starting from the lowest priced, leading to the most expensive at the bottom. So without further ado, let’s talk about the best bass multi-effects processors in 2019! Runs on a 4 x AA batteries, but can also be directly run on a 9v power supply (not included) or via USB connection. 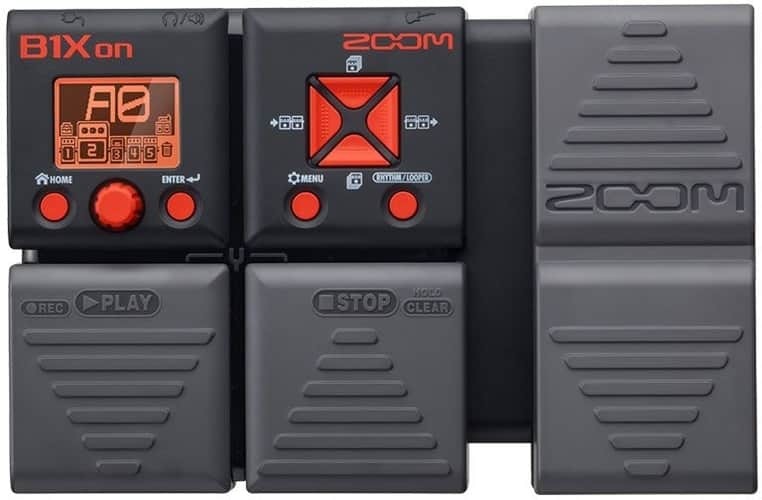 The Zoom B1on Bass Multi-Effects Pedal certainly provides fantastic bang-for-your-buck! This unit is ideal for the bassist who’s after a lightweight, highly portable bass processor, which also has a huge range of features & functionality. With over 100 effects to choose from, alongside 100 memory banks for the storage of user-created patches, it’s really able to provide you with a lot of customization in such a small unit. This includes the unit being able to emulate such pedals as the MXR DynaComp, dbx 160A, Moog MF-101, etc… And such classic tube amplifiers as the Marshall Super Bass, Fender Bassman, Ampeg SVT, etc. With over 100 available DSP bass effects, and with the option to use up to 5 effects simultaneously, it’s really a great unit… And all below $80! It’s a true steal. As for the way in which the Zoom B1ob sounds, we like this processor, it has such a wide range of sounds to offer. The quality is good too, but remember this is around $80 and not $800, you’re not going to get your socks completely blown off. However, you will feel a tingling! This pedal is suited to the casual bass player, someone who does the occasional gig, but is really looking to use this (with the use of rhythm patterns that can be played to) to facilitate your creativity, helping you write those incredible bass riffs. The StompLab 2b is Vox’s answer to a bass multi-effects unit, aimed at providing a large range of effects and amplification simulators, whilst still being affordable to the everyday musician. The unit itself is priced in the same range as the Zoom B1on, and they are very close in their feature-set and functionality. 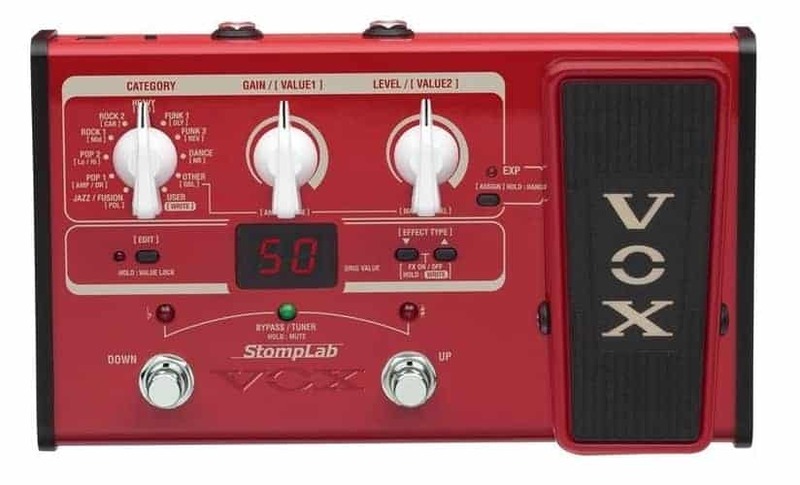 Some great selling points of the Vox StompLab 2b would be the strong, rugged metal casing that is beneficial to ensure longevity, alongside the fact that it’s built by one of the most renowned music equipment manufacturers in the world, so you should be confident in assuming it’s made up of high-quality components and has been tested meticulously. As for the way in which the Vox Stomplab 2B sounds, well this really depends on how you plan to use it, for example, the clean effects, alongside wah and slap-bass settings sound awesome; However, some of the more overdriven effects can sound a little overwhelming. This pedal is suited to the more casual bass player, but can definitely be used to play shows with it being built to last. The sounds that this processor can create are good, as long as you know there are limits to it’s capability, which were apparent on distortion/overdrive settings. Runs on a 2 x AA batteries, but can also be directly run on a 9v power supply (not included) or via USB connection. 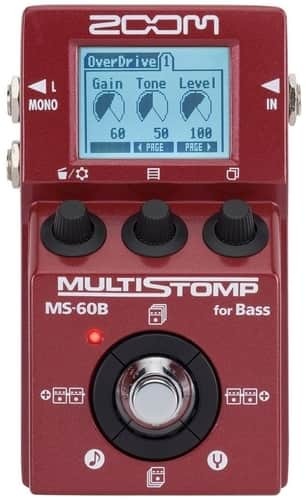 The MS-60B by Zoom is the second unit by the brand to feature on our list of top bass multi-effects processors. This unit is highly compact and has a rugged metal casing, making it extremely suitable for the gigging musician. Not only this, but similarly to the Zoom B1on it offers a range of effects (although not as many), programmable patches and amplifier emulations. The main difference between this pedal and the Zoom B1on, other than the metal casing, is the stereo output. Therefore if having a bass multi-effects pedal with stereo output is important, this may be the one for you. The MS-60B can be powered from 2 x AA batteries, which is the least number of batteries needed by any unit we’ve featured on this list. As for the sound quality, it really does impress; A solid sound quality on most of the effects, and it really does provide some versatile sounds, from arpeggiated synths to swooping synths, to heavy metal distortion (which surprisingly sounds somewhat good). Someone looking for a highly portable, small, ruggedly built multi-effects processor for bass, with stereo output. This pedal sounds great and has a bunch of functionality to play with. 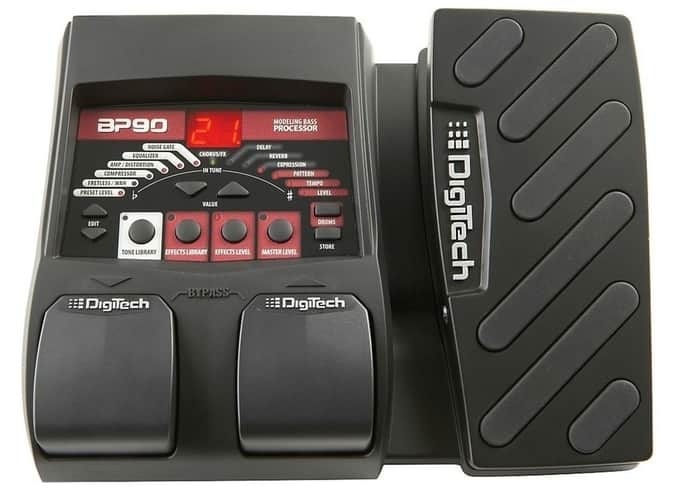 The Digitech BP90 is the brand’s bass multi-effects pedal. It comes at the high-end of what would be considered a lower-tier budget, and for this you do get a range of functionality, including plenty of bass effects, amplifier/cabinet emulations and presets to choose from. As for where this processor sits in comparison to others around this price-point, it’s safe to say that we believe there are newer, more technologically advanced and better-sounding processors on the market; I.E the Zoom MS-60B. However, please don’t take our word for it alone, check out the demonstration videos to get a full audible representation of how it sounds in comparison. As for the sound quality, it’s really good considering the price. Some of the effects that stood out for us as being particularly good were the cleaner reverbs and chorus effects. This would be great for the casual bassist looking for a pedal to practice and jam with. However, even despite how impressed we were about this device, we’d still highly recommend one of the pirce-equivant Zoom pedals. Yet again, another Zoom processor in this article… But that’s because they are really that good! 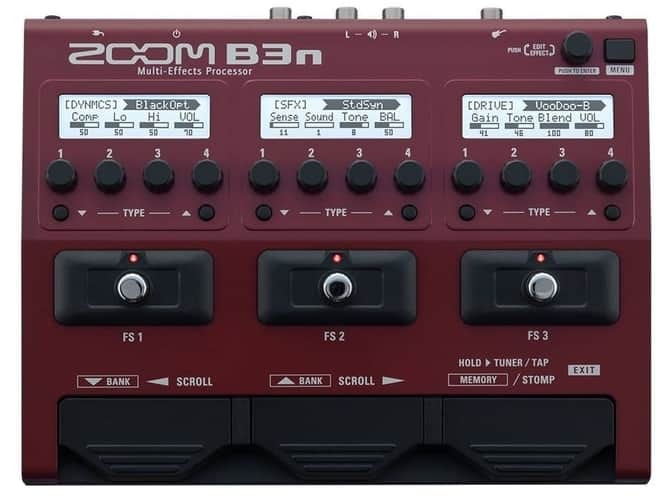 The B3n provides 3 LCD screens, and 3 multiple-use stomp-pedals similar to it’s predecessor, the Zoom B3, but has an updated chipset and greater processing power. The real update is the fact that 5 effects can be used simultaneously in the B3n unit, unlike the B3 unit providing 3. This unit comes with 67 bass effects, alongside 100 memory locations where you as the user can store your own user-created patches. Directly comparing this against its predecessor, the Zoom B3, it does provide fewer bass effects (nearly half with the B3 unit offering 111), however, it’s about quality, not quantity… With new patches being released for the B3n, as the B3 has now been discontinued. Additionally, this unit provides 5 adjustable amplifier/cabinet emulations so you really have a wide range of sounds that you can obtain. However, despite the B3n unit being the updated model, it does not provide a DI output like the original B3 unit does. As for the sound quality of this unit, it sounds decent, especially for cleaner sounds. It does feature some effects which simply should not be used in any kind of commercial music, but the majority sound solid. This is ideal for the bassist who wants a huge array of effects which can be modified through using the DAW interface; The advantage of this processor is simply having three footswitches, which would make quick patch changes very easy. 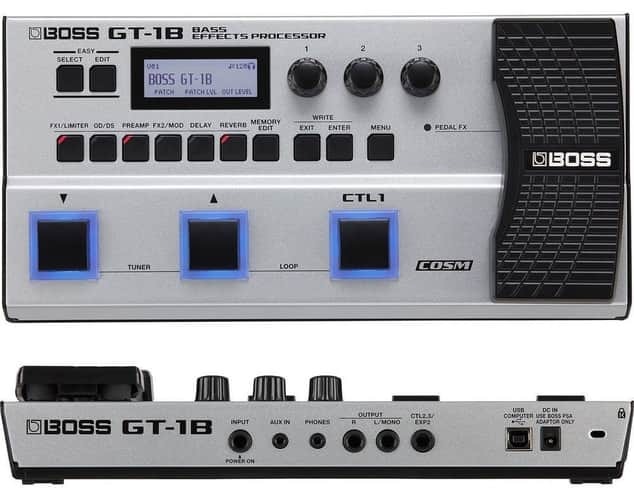 The Boss GT-1B is marketed as Boss’ more premium-priced multi-effects bass unit. Looking closely at the range of functionality, alongside the technology behind the processor itself, it’s no wonder why it’s priced within this range. The processor itself uses MDP (Multi-Dimensional Processing) Technology, which means that the input signal is segmented into many different elements based on the following criteria, pitch, loudness and timbre. By segmenting the signal based on these variables, the GT-1B is able to apply effect processing in a more detailed, refined way; Giving it a much better sound. For more information on MDP visit here. You have access to 90 bass effects, and 99 user programmable presets; Presets can be downloaded and updated via the USB connection, and there is an on-board easy-edit mode for quick changes. As for the sound quality of this unit… Yeah we really like this one! It honestly sounds great; Just take a listen to the first demonstration video. My personal favourite effect was the most unlikely one called ‘Atmostphere’, which you can hear in the second video demonstration at 2.38. We’d recommend this to a professional bassist looking for a long-term unit, for on-stage use and in-studio usage. Effects include Limiter, Graphic EQ, Para EQ, Attack, Wah, Filtering, Booster, Overdrive, Distortion, etc. Emulating pedals such as Electro-Harmonix Big Muff, Fuzz Face, MXR Bass D.I.+, Fender Bassman, Hartke HA3500, Ampeg SVT, etc. As you can see, we clearly love Zoom… Well, we like them very much because they make really great processors, and the Zoom B3 is no exception. This unit comes with 111 bass effects, alongside 100 memory locations where you as the user can store your own user-created patches. Additionally, this unit provides a range of amplifer/cabinet emulations which will keep you up until the early hours of the morning. 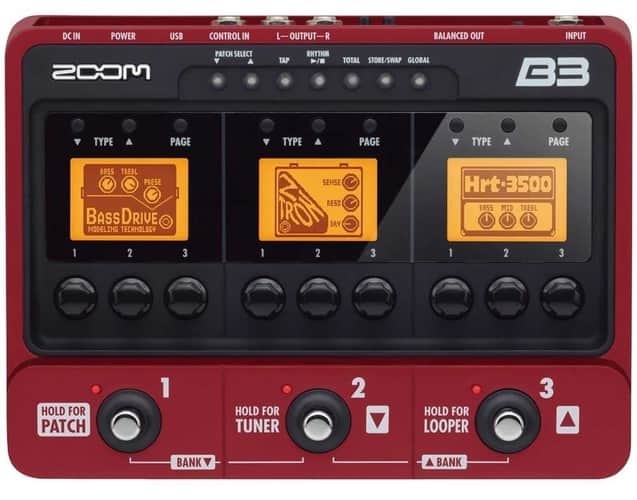 A unique feature about the Zoom B3 is the three LCD screens on the front of the interface, making it especially useful for someone looking to quickly change between more than 2 patches within a song/performance. These three LCD screens correlate with the 3 footswitches, which have multiple uses when held, providing quick access to the tuner and looper. This more than makes up for the lack of an expression pedal, although there is an input for an external expression pedal for those who want one. However, unless you really need the DI output, take a look at the B3n which we review further down in this article; Since the B3n is the newer model. The Dapper multi-effects pedal by Valeton is a thin unit, very similar in size, price and functionality to the Tech 21 Bass Fly Rig. The unit consists of a metal outer casing, with analogue inner circuitry, helping give it a nice warm sounding output signal. The output signal can be routed through a 1/4″ inch jack and/or XLR output, making it great for live stage performances. As for the sound quality… It sounds very nice, although we would prefer the Tech 21 unit over this processor, as this seemed to squash the overdriven sound a little too much for our liking. This unit is also particularly expensive. Based on numerous factors, we would probably advise anyone interested in this unit to instead look at the Tech 21 Bass Fly Rig. However, take a look at the video demonstrations to come up with your own opinion. The Tech 21 Bass Fly Rig is an old school looking processor; With its metal casing, LED lights and multiple metal stompboxes, it really gives off a vintage vibe. The processor itself utilizes an all-analog SansAmp which helps capture a rich, underlying warmth and natural tone that is associated with the most sought-after tube amps. With this technology being the foundation of how this unit works in creating that warm analog sound, it really does well at providing overdriven & fuzz-like sounds. So how does this sound overall? It really does sound good, and the SansAmp analog technology really makes a noticeable difference on the sound of the more overdriven settings… It sounds great for slap-bass. Additionally, the chorus tones sound fantastic too! The only major negative for us is the price of this unit, being nearly $300 it may be a little steep for some, but considering the sound quality, it’s great! We highly recommend this to the bassist looking for that vintage, all-analog sounding pedal. Just take a listen to the video demonstration, you’ll understand what we mean. 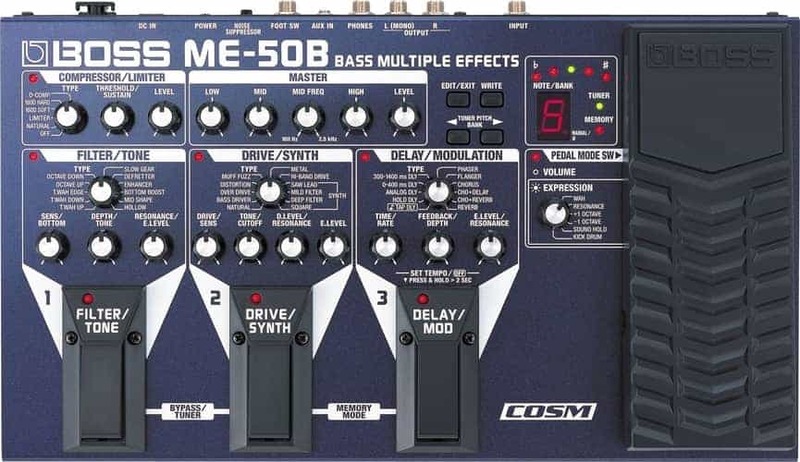 The Boss ME-50B is the golden standard of Bass Multi-Effects Processors. The unit itself has been around since 2004 and remain to this day a best-selling product; This is because it has so many fantastic characteristics which are worthy of praise. Firstly, this unit has an extremely solid construction making it ideal for the gigging bassist bringing this on the road. Alongside this, the processor has 23 user programmable memory banks, with each bank being able to store 3 sounds per stomp pedal; That’s sound customization sorted. Additionally, the 3 stompboxes can be engaged individually or simultaneously to create custom sounds, meaning the possibilities are endless (or near to being). A nice thing about this processor is that it gives the user the choice as to run it on a 9V power supply (which is not included) or battery power (6 x AA batteries); So if the venue only has a few plug sockets available, that’s not a problem for you! As for the slight drawbacks surrounding this product; Well it’s nearly 14 years old, but we can safely say considering it’s still a best seller that the sound quality has stood the test of time. Other than this, it’s still a little pricey, being over $300. However, considering the sheer amount of functionality, this is a small price to pay in the long-run. For those gigging bassists who want a highly reliable multi-effects pedal for bass, which will and has stood the test of time. It clearly has a multitude of features and sounds good.